Standing Seam Metal Roofs Are Made OF Vertical Interlocking Seams. Metal roofing is an increasingly popular choice for both residential structures across the state. This is because all types of metal roofs provide you with a surprising amount of benefits that can save you hassle and money for decades. For example, a metal roof can last twice as long as a traditional roof system, which means you get a longer lasting roof from the initial installation. Additionally, metal roofs provide your building with increased energy efficiency, which leads to lower energy bills throughout the year. You can even expect discounts with certain insurance agencies, since metal roofs are less prone to storm damages, and have a fantastic fire resistance rating. If you are interested in learning more about our professional metal roof installation in Texas, Louisiana, and Mississippi, give us a call today at (833) 200-0571! If you are interested in adding a metal roof to your home, both standing seam metal roofs and stone coated steel are great options to consider. Standing seam panels provide reliable protection and a modern appearance for your home and are typically the less expensive option. You can also choose standing seam in a variety of great colors, to match and accent your home. Stone coated steel options are designed to mimic the appearance of traditional roof systems such as tiles and shingles, while still providing you with the protection you want and need. Available in large panels, standing seam provides resilient protection against leaks across expansive roofs thanks to their vertically interlocking seams. To learn more, or to schedule your quote and assessment for metal roof installation in Texas, Louisiana, and Mississippi, speak with any of our experts at (833) 200-0571 today! 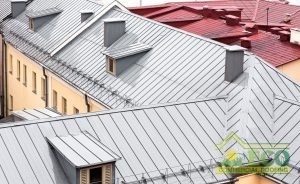 Standing Seam Metal Roofs Standing seam metal roofs are a great addition to modern homes. Stone Coated Steel Roofing Stone coated steel roofing allows you to keep the traditional residential roofing style, with improved protection. Corrugated Metal Roofing Corrugated metal roofing panels provide your roof with additional strength and durability. Metal Roof Shingles Available in a wide array of textures and styles, metal roof shingles are a great addition to modern, as well as traditional homes.